Landrum Chemical proudly serves the Midwest region for all your chemical and cleaning needs. 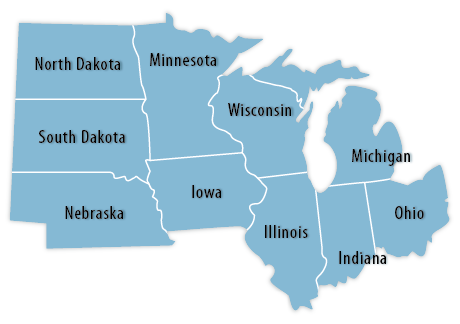 We have the capabilities to ship to Indiana, Ohio, Illinois, Michigan, Iowa, Wisconsin, Minnesota, Nebraska, South Dakota, and North Dakota. Contact us for more information about our commercial and industrial cleaning chemicals available for all of your cleaning needs.